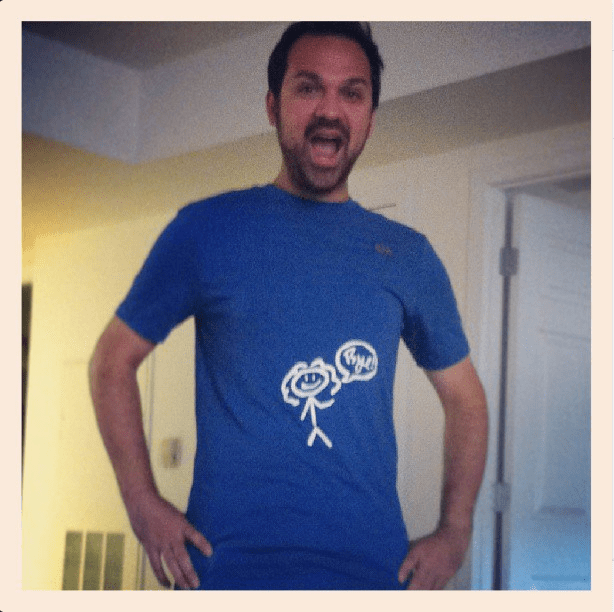 Craft Testing: Doctor Who Modge Podge Screen Printing – Allons-y Craft! I remember in college making shirts for EVERYTHING! Concerts, parties, holidays, Friday night movies – the Old Navy t-shirt section was never safe. Back in the day I invested in the whole screen printing kit: frames, screens, bulbs, photo emulsion, the whole nine yards. It was expensive and time consuming, but the shirts always turned out great and that was enough for me. This week I decided to try my hand at a more budget and time friendly option – modge podge. Yes, that wonder glue can really be used for anything. It’s no surprise to the people that know me that I am a big nerd and I watch a LOT of television. My favorite show of the moment is Doctor Who. As the longest running show on television, there is no way to sum it up effectively, but here is the super cliff notes version: it’s about an alien who can travel through all of time and space with his spaceship (accidentally) disguised as a 1960’s police call box, and usually has a human companion with him on his adventures. In one episode, companion River Song uses her hallucinogenic lipstick to escape her space prison cell. The guard thinks he has her detained, but it is really just a drawing. 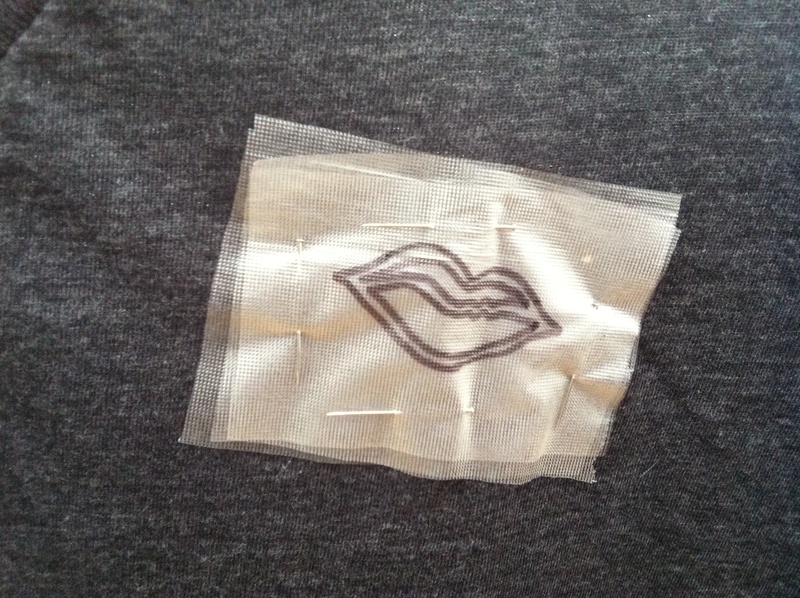 I thought it would be cool not only to put this design on a shirt, but to embroider a set of lips on it as well. Get it? Yeah, I know, nerdy awesome! Check out how it went after the jump. Allons-y! Step 1: I’m very high tech, so I traces my image straight off the television with a pencil and tracing paper 🙂 I then traced it again on my sheet of screen fabric with a sharpie to make sure I could see the lines clearly. Step 3: I taped around my design just to make sure my painting surface was secure. I poured on the white paint in a thin line in the taped area and used the squeegee to spread it across the design. I went back and forth to make sure paint saturated all of the design. Step 4: Because the shirts I used were so soft, I had to use a fabric stabilizer and embroidery hoop to ensure my hand stitched design would not pucker. Once again I used my high tech method of tracing, this time off of the computer screen, on to the tracing paper, then again onto the fabric stabilizer. I used the water soluble kind because I think it’s the easiest to clean up (just wet it to wash it away). I cut a square slightly larger than my design to pin to the shirt. With this type of stabilizer since it is so thin you will need to layer several sheets (3-5 will work for a design this size). I outlined the lips in a back stitch and filled it in with a split stitch. And ta-da! River Song was here!!! Here is my buddy and fellow Whovian, Quenten showing off his limited edition shirt!!!! Quenten has had a brush with hell…in high heels! All in all, modge podge screen printing is definitely a cheaper alternative than the more robust traditional version. That being said, I think it also works best for simpler less detailed designs. It gets a 8.7 rating from me in the quick and dirty DIY department. If you guys try it out, let me know how it works for you. And remember to beware of time travelers reapplying lipstick! Next Next post: Hiatus, much?